10th Mountain Division Association, Inc. This page was added to the Grindelwald Ski Club web site upon request by Bruce Campbell, a longtime member of the 10th Mountain Division. The Nat'l Assn of the 10th decided, at their last Board Meet in Denver on Aug 1, to allow those interested to complete an application for membership at "Friends" of the 10th Mountain Div. Bruce has such applications available for anyone interested. The annual fee is $20, entitling the member to an ID card, receipt of the Blizzard publication, and as a member of the So. California Chapter, a copy of our Rucksack newsletter. Such Fiend may also attend any of the 10Th's National reunions and even such reunions taking place in Italy (touring Florence, the "Hill towns" in the Appennies, as well as any and all of the activities of the local chapter, including annual ski-in at Big Bear and the annual Oktoberfest also at BBL and our annual Christmas party (12/01/07) Lots of nice people too - too old to ski, but socially active!! For their Web Site click here. OF THE 10TH MOUNTAIN DIVISION? 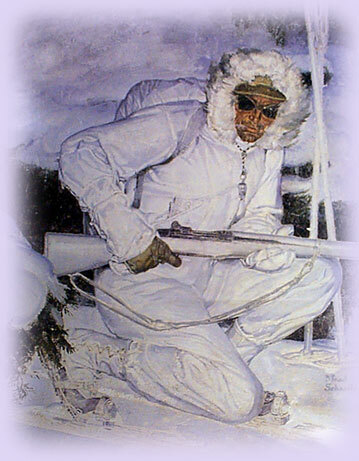 The Association was founded after the World War II by a handful of combat veterans determined to form an alumni organization that would carry on the traditions of the 10th Mountain Division as one of the most unique combat forces in American military history. Its purposes include fostering friendships among all soldiers of the 10th, and encouraging mountain and winter warfare training within the armed forces of the United States. Since 1985, when the Division was reactivated as the 10th Mountain Division (Light), we have welcomed its soldiers and veterans as members of our Association — as we do veterans of the Vermont National Guard's Mountain Battalion. Administering a scholarship program for children of the 10th veterans. In the Denver Public Library and Colorado Historical Society, a vast repository of veterans papers, photographs and oral histories includes a computer database of the service histories of the 30,000 men who served in the division in WW II. Located in the central Rocky Mountains it is a network of thirty-one huts situated between 9,700-and 11,700-foot elevations ranging over 350 miles of open-country trails, logging roads and railroad grades. In 1987, the roots of this organization were planted, and over the years this organization has grown steadily in numbers and diversity of their programs. Presently their membership is over the 1000 mark. In 1985, the Association became international in scope by participating in the formation of the International Federation of Mountain Soldiers (IFMS) whose objective is the quest for comradeship and peace. Today the IFMS represents more than 450,000 mountain troop veterans and active duty mountain troops from nine nations: Austria, France, Germany, Italy, Poland, Slovenia, Spain, Switzerland and the United States. The Association was incorporated in the State of Colorado as a veterans organization. The present headquarters is in New York at PO Box 750888, Forest Hills NY 11375-0888. A contribution is tax-deductible to the extent allowed by law, since the National Association of the 10th Mountain Division is a 501(c)19 veterans organization. Do you like the adidas Yeezy 350 Boost Low Kanye West Turtle White Size 9 Aq4832 ,read here.